It's pouring rain outside my window. My poolside patio is doing its monsoonal flooding which hopefully the French drains will soon take care of. We are supposed to be in dog agility class right now, but of course, it was canceled due to the you know what. We need the you know what so I am not complaining. As you know, its also been raining babies in our world lately! So, I thought I'd post some more pictures of the cute little ones. 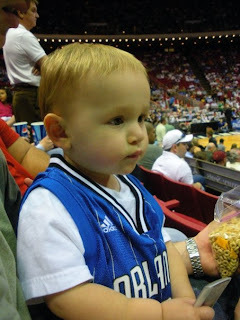 The first picture is fourteen month old Alex Khoury intently watching his first Orlando Magic football game. 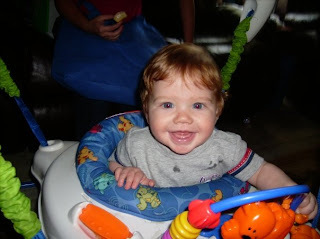 In the next picture, nine month old Gavin Scott is having fun in his bouncer contraption. 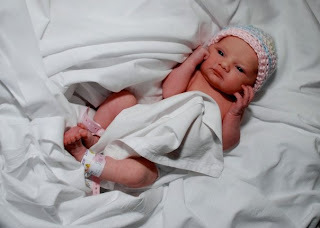 Picture number three shows our new little princess, Bailey Lynne Brown, about one week ago when she was just a day old. 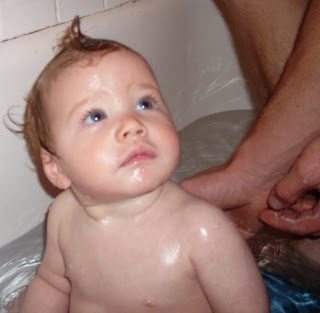 In picture four, Alex meets his new cousin and in the last Gavin does a Kewpie doll imitation in the bath. Of course, I may not be totally objective but I think they are all adorable. 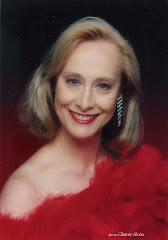 On the Home front: I am happy to say that thanks to Jamie Morris and her writing workshop for providing inspiration, I am again working on my YA novel and several short stories. I am also gathering information in hopes of purchasing a vehicle that will enable us to do some auto traveling with the dogs since we have a real aversion to traveling without them. (even Chili) This has been interesting if somewhat time consuming. Here's a weird confession: I have had an extreme aversion towards flying in commercial airplanes ever since 9-11. Somehow the events of that day intertwined with flying in my head (even if that is totally illogical) and I just can't make myself do it. Not for fun anyway. So, I'm earthbound. Tomorrow, we have a wrap up and planning meeting for the art festival and I am really curious as to how we did financially since it was mobbed all weekend with about 350,000,00 art lovers. Yes, we really do start planning for next year right after a festival closes! This one was the 51st WPSAF and my 12th on the board although I volunteered for several years before joining. Thought for pondering: The bee may have honey in its mouth but it has a stinger in its tail. Live long and prosper my little Patawans. 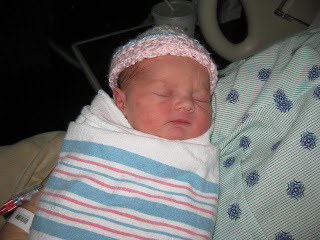 Here's a couple more pix of newborn Bailey Brown. She went home with Mommy n Daddy on Tuesday and all is well. 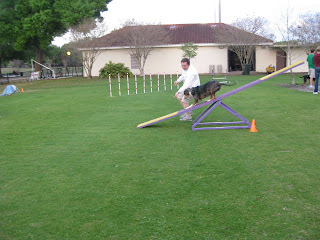 Agility class on Tuesday did not go well. The trainer said the group was going to spend the evening doing something called "Snookers" and that the course set up was a Masters Level. Don't ask me what that means. Even after several explanations, I still didn't understand. Neither did Danny or the other three humans new to Level Three. Since the humans were confused, their dogs had no idea what to do either. One of the rules of the Snookers thing seemed to be that if you or your dog made any kind of mistake, you left the field. So, as you might expect, Ginny got precious little exercise and had no fun and Danny was very very discouraged. Most of the class have been in Level Three for awhile and I got the idea that most if not all of them regularly enter agility trails so they all understood and had bunches of fun. Danny and Ginny didn't learn anything from the Snookers game and I suspect aren't looking forward to the next class if this week is any indication of what's ahead. Danny's mellow was definitely harshened and Ginny could sense his dejection and was dejected herself. The other thing I personally don't like about this class is that the people competing for titles with their dogs spend anywhere from ten to twenty minutes or more all talking about what shows they did since the last class and what their points were and ranks etc. before actually getting to work with the dogs. They call it a brag session. I don't get the reason for this. On a busy work night I would think it would be better to get right to work training and leave the brags for the email group messages. But what do I know? I'm not training the dog and will never be in a trial with her. I'm just there to watch her fly over the jumps and do the tunnels, etc. So, I get bored waiting. The week has flown past on pollen particles. Weather is divine...in the seventies and eighties but the oak pollen is so thick on my pool screen that I can't see the sky. Achoo! March is almost gone and the Easter Bunny's gearing up. So is the evil Income Tax fairy who wants some more of my Recession money. Frakkin' fairy! Ta for now. Thought for the day: In between meals I hate myself. 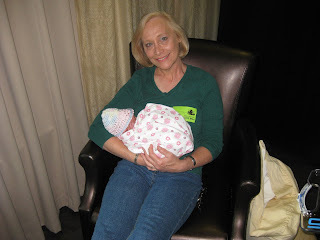 Announcing the safe arrival of my first granddaughter, Miss Bailey Lynne Brown, on March 23, 2009 in Orlando, Fl. She's a six pound, brown haired, blue eyed little sweetie. Now, I have a Princess and a Pirate laddie! For more pix see my flickr page. Parents, Laura and Paul Brown are tired but happy and all is well. Ta. 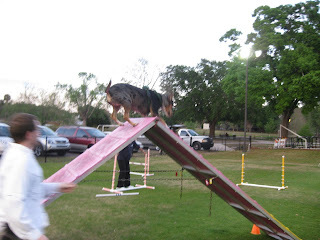 Hey bloggers, heres some pictures from agility class last night. Ginny and Danny are doing great! Hope y'all had a great St Paddy's Day. Locals come out and see us this week end at the 50th Winter Park Sidewalk Art Festival. danny and me that is: no dogs allowed (city ordinance). three small burped carmaker cucumbers, bruised, scraped and sliced. Pelosi's Says-a-Me Special Senate oil and vinegar dressing. Rub one very large pork tenderloin with Arabian overpriced oil, bi-partisan broken promises pepper and a pinch of Alternate Energy salt, and marinate for one congressional session in New York Exchange stock boiled down to almost nothing. Overbake at 375 degrees in your oven as long as you can stand the heat in the kitchen. Serve with lots of liberal and conservative gravy, mashed Idaho entitlements, and green has bean mortgage brokers, billionaire bendover buns easily obtained at any Super market, and as many bottles of red-blooded American whine as it takes. and a couple of pinches of warm belly hugs. drop in one cup of pink tongue kisses. love for a dozen years or more. Achoo!! I am writing from the current pollen capital of the USA...where the oak whatcha-majiggys are drifting to the roadways along with the leaves. Everything that didn't die from our recent freaky winter freezes is blooming. Achoo! I'm trying not to rub my reddened eyes, my nose alternately congests and drips, my skin itches, and I'm popping Benedryl and Actifed. The pollen comes into the house on my clothes, my hair, and the dogs wear it in their fur. Its even in my bed. 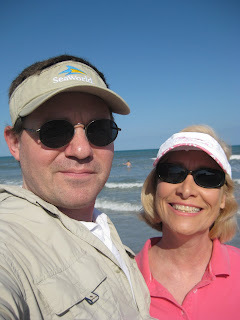 To escape this misery, Danny and I went to Cocoa Beach yesterday. It was divine. Sunny and just warm enough, ocean breezes, no tree pollen anywhere. We felt better instantly, more energized, and away from the ever more gloomy state of the Recession reports on TV and in the print media. 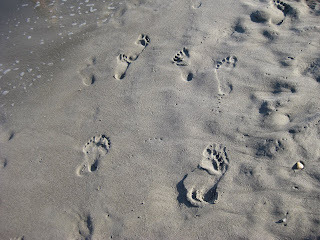 We walked along the beach for two hours, toesies in the cold surf and watched the first wave of collegiate and high school spring breakers enjoying the watery breakers. Obviously most of these folks are from the North. I don't go in water that's colder than 82 degrees! 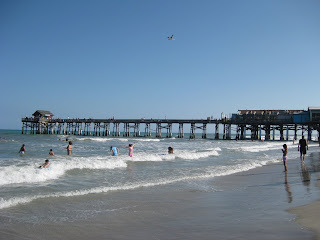 Bike Week over in Daytona was ending and there were some motorcycle afficionados on their way south enjoying dinner and drinks in the old timey tacky seafood restaurant next to the famous Ron John's Surf Shop where we had our supper post walk. We overheard the couples sitting adjacent to us say they were from Ontario and Texas. After supper and a quick peek inside Ron Johns, we walked back down to the beach to enjoy the sound of the surf and the almost full moon hanging like a lantern over the ocean. Then, home to sneeze again. Still, the first day of Daylight Savings Time was practically perfect and made me grateful to live in a place where it is so easy to take a day's mini vacation: thirty or forty minutes to a world famous theme park and an hour to the beach! 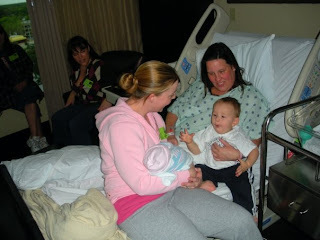 On the Homefront: only a few more weeks now until Laura's baby is due to arrive, Amy and Elias are working hard to get their new 7-11 store running at peak efficiencey, and Baby Alex got bit by another toddler in daycare. 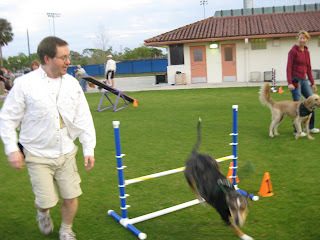 Ginny and Danny start Level Three training in Dog Agility class this week (Postponned last week), and I am working again on a novel I abandoned two years ago in frustration. I am still hoping that the pollen drop will be over before I have to walk all day with the Judges in the Art Festival on March 20th. I completed my tax prep and mailed it to the accountant on Thursday last. That was amonumental job again this year thanks to my mother's estate settling last May. On an ironic note: I spent ten minutes and a lot more than 180 characters telling Danny what a shallow, superficial waste of time Twitter is. Stupid name, too. Then, I happily wasted ten minutes on Facebook and fifteen more minutes playing the Yeti Penquin Toss game on my desktop PC. Yesterday, it was 82 degrees outside and sunny. Today, it's in the 50's and dropping fast, windy and stormy. Winter's back but the oak pollen is still falling like snow up nawth, dang it. Achoo! It was an interesting week, though. As you can see from the pictures above, Danny is now a Knight's Templar. Yes, all you DaVinci Code and National Treasure fans out there, the Knights are still around. These days, of course, they don't physically battle Muslims in the Holy Land. In the 21st century such tasks are undertaken by Army, Air Force, Coast Guard personnel. 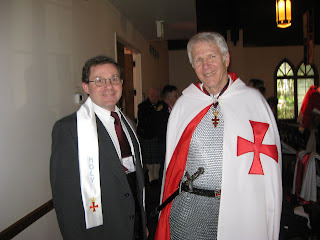 The Templars do, however exemplify Christian ideals and raise money for various charities (the local priory helps the local Veteran's Hospital) and give financial aid to the Christians in the Middle East. Membership is by invitation. Most of the Knights are or were military men, but not all. This week end was a Knights Conference ( 2009 Vernal Convent) and included an investiture for three postulants as well as a banquet after. 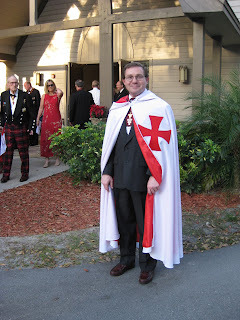 Danny had a vigil on Friday evening and was tested on required study regarding the Templar's illustrious history prior to being knighted. 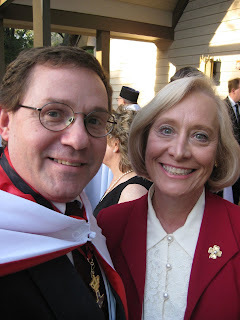 He is now a Chevalier of The Holy Rood Priory of The Sovereign Order of the Knights of Jerusalem. Hail, Sir Daniel, caped crusader. On another front, we were excited that Danny and Ginny graduated from level Two Agility and are now beginning Level Three Dog Agility training Tuesday evenings. They make a great team! Younger daughter, Amy and husband Elias opened their very own 7-11 franchise store on Friday morning. I got a free donut and coffee as payback for getting organized and cleaned up early to offer congrats in person. Mornings are not my best time and coffee helps. Its getting dark as night out and its not even lunch time yet...creepy...maybe a movie day at home for us. No walks for the doggies. Live long and prosper. Ta.